The DoorJammer is a unique new and innovative portable door security device for anyone needing privacy and more home physical security. The DoorJammer is ideal to install at the bottom of your fixed double door entry keeping it locked and secure. The Doorjammer is great for homes that have double entrance doors whereby one is normally fixed and the other is the functional door. If the fixed door is defeated your locked door will not protect you at all. It is mission critical to keep the fixed door secure during forced entry. Many home owners neglect to insure that the flush bolt pins on a fixed door are properly engaged at all times. The Doorjammer is a physical security solution that will visually insure your door is not going to open regardless of the status of the flush bolt pins and insure the fixed door remains locked and secure. The DoorJammer is also ideal for travelers, single men or women and seniors looking to protect them selves from home invasions & forced entry. It is completely portable & discreet enough to prevent unwanted intrusions into any room in your home, giving anyone a feeling of instant barricade security. The DoorJammer can fit under most residential doors in just seconds and is easy to use by anybody with no special tools required for installation. The DoorJammer is an ingenious security system made of hinges and angles that work together to protect you and your family. The horizontal force that is exerted on the door from the outside by a burglar is converted into a vertical force maintaining the DoorJammer firmly onto the ground keeping the intruder on the outside and you & your family safe on the inside. Simply insert the bottom flange into the space under the door, make sure to position the DoorJammer under the door handle, turn the bolt to the right until the engagement is secured, then pull the door to test that it is secure. Feel a little more at ease when traveling or at home with The DoorJammer Security Door Brace! The DoorJammer installs in seconds to "Jam the Door" in the locked position. 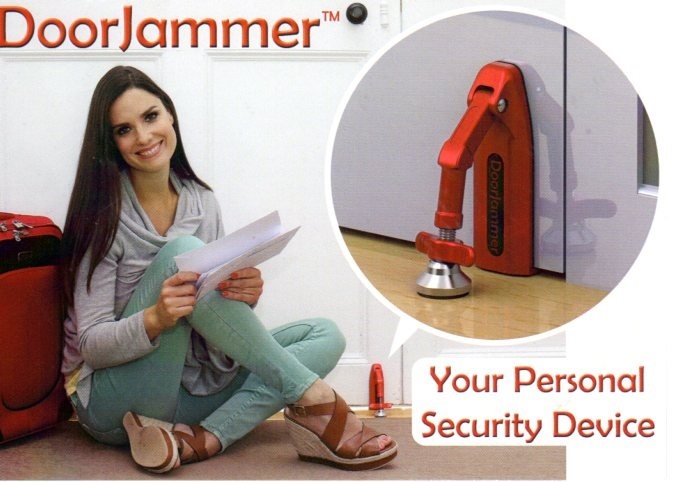 You will feel totally secure knowing the DoorJammer is on the job in your home. The adjustable rubber foot at the end of the hinged leg allows the DoorJammer to be installed on virtually any surface including hardwood, floor, carpet, tiles, linoleum and marble flooring. The DoorJammer will reduce entry from intruders on most doors from being kicked in while you are home giving you a chance to call the Police before the intruder gets in. The DoorJammer has been engineered to easily be removed in the event of an emergency. In case of emergency you can simply pull the DoorJammer upward to quickly remove it from the door and exit your home. Call us today and order your DoorJammer at Pre-lock Security Services Inc.
Act Now Receive Free Black Velvet Travel Bag.